As a special offer for 2018, each purchase of a new VideoFOCUS Pro Perpetual or Subscription license, or a maintenance renewal to an existing VideoFOCUS Pro license, with the maintenance contract covering the period including 30 November 2018, is entitled to one complimentary tuition (a $900 value) in any advertised US training session in 2018. Please click here for complete details and enrollment information for upcoming US training sessions. Having completed the initial beta testing period, both VideoFOCUS Pro and VFSource Version 7.0 are now in general release and are available for download and installation under all licenses having a current maintenance contract*. Cases Now Described Through a Standardized Text File, not a version-specific binary file as in previous versions, enabling new cases created in versions 7.0 onward to be opened with later versions. Please watch for our automated support messages informing of new releases, and also periodically check our support website for the newest versions of VideoFOCUS as they become available. * Under Upgrade Amnesty, any previously-purchased VideoFOCUS license is now eligible to gain entitlement to all new versions for one future year with the purchase of a 1YR maintenance contract. To request a quotation to renew maintenance on your VideoFOCUS license, please complete and submit the online form and either we or your in-country dealer will respond as soon as possible. Improved Subscription Licensing Now Available for VideoFOCUS! Since the release of Version 4.0 in 2012, both Perpetual and Subscription licensing have been available for all VideoFOCUS software products. As of Version 6.0, Salient Sciences additionally offers USB Dongle Activation for Subscription licences, allowing these date-limited licenses to be shared across multiple machines and operated without an internet connection in the same way as dongle-based Perpetual licenses – an important consideration for workstations housing sensitive data. When a Subscription license is purchased with USB Dongle Activation specified, a special RTC dongle having its own real-time clock (or “RTC”) on board will be supplied at no additional cost. This independent RTC enables VideoFOCUS to reliably manage the subscription term, even when an internet connection to a trusted time server (e.g. nist.gov) is not available. For Perpetual licenses, which are not date-limited, a non-RTC dongle will be supplied. Pictures of the two dongle types are provided below. With Perpetual licensing, the customer “owns and maintains” the software license. Analogous to buying a car, there is a significant initial investment to purchase the license, which includes an initial maintenance contract providing entitlement to all new versions that are released during that first year of ownership; thereafter, the customer can purchase a new maintenance contract each year to continue entitlement to the latest versions. For most of our customers, Perpetual licensing is preferred, because they never have to worry about a critical forensics tool ceasing to work for them if budget is not immediately available to renew the maintenance. Even if the maintenance should expire at some point without renewal, the software continues to function indefinitely at the most recent version that was allowed under the last expired contract (also called the “last entitled version”). But for smaller customer agencies who may find it prohibitive to absorb the larger initial cost for the Perpetual license, the “rent and maintain” model of the Subscription license may be more attractive. Like leasing a car, the initial cost is more modest – essentially, you pay for the first year’s maintenance contract and you can start using the software immediately with full entitlement to all updates while the contract remains active. The main potential downside of Subscription licensing is that if the maintenance is ever allowed to expire without renewal, the software will simply stop working – possibly making for a bad day if the maintenance happens to expire in the middle of a critical case! The other potential downside of Subscription licensing is the need for the software to have a trusted clock source to reliably enforce the subscription term. Traditionally, our Subscriptions have used Online Activation only, meaning that the computer had to have an internet connection or the software would not run – again, potentially a big problem for machines having sensitive data. However, this limitation is completely overcome in Version 6.0 with the USB Dongle Activation via the RTC dongle. To minimize any disruptions of Subscription licenses, and also to ensure that Perpetual license customers continue their entitlement to all the latest versions of VideoFOCUS, Salient Sciences starts e-mailing maintenance renewal pro forma invoices within 3-6 months of the maintenance expiring, which hopefully allows time to purchase the renewal and avoid any issues. Where necessary and appropriate, temporary maintenance extensions can be quickly granted by Salient Sciences sales (just e-mail us at sales@salientsciences.com) to keep VideoFOCUS running at the latest versions while the maintenance renewal purchase is being processed. Drop on the VideoFOCUS app icon (new). First I should mention that VideoFOCUS uses a number of stages when trying to import a file. These include examining the file to see if it is a supported proprietary DVR format, a standard audio or video file, a raw encoded video stream, an image sequence, or an individual image. No matter which way you choose to import, all of the appropriate stages are attempted to maximize the chances of a successful import. To use “open with” to import a file, simply right click on the desired file’s icon wherever it appears and choose the open with action in the popup menu. If VideoFOCUS is not showing, select “choose another app”, then select VideoFOCUS from the list. VideoFOCUS does not automatically claim any file associations but the Windows OS may offer to make VideoFOCUS the default for the file type chosen, so be sure to adjust the checkbox setting as desired. 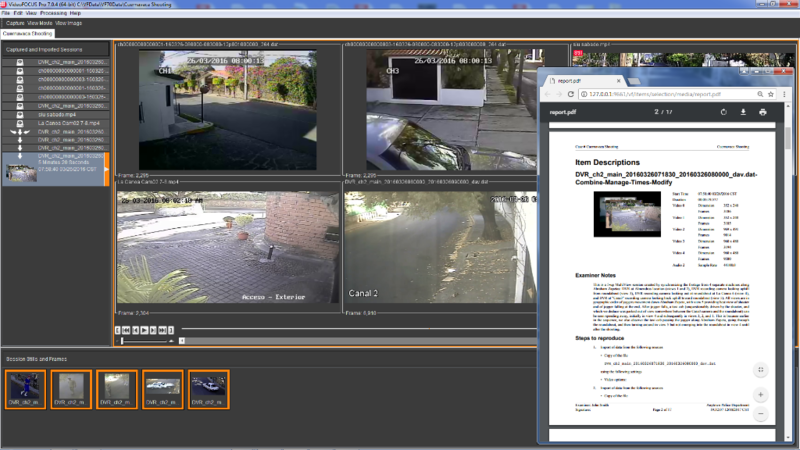 For those using the DME Forensics’ DVR Examiner product we are also pleased to announce that in their latest release, VideoFOCUS is now an option for opening media files directly from within DVR Examiner. “Open with” support also brings the ability to drop a file onto the VideoFOCUS desktop shortcut and have it open in VideoFOCUS. Just like “open with” and open from DVR Examiner, if VideoFOCUS is already running, the file will be imported into the currently selected VideoFOCUS case. If VideoFOCUS is not already running, then it will be started and the file will be imported into whichever case was last selected. Alternatively, if you have one or more files of a single type that you wish to import, drag and drop is often the quickest way to import. Open VideoFOCUS so that the main window is visible, select the files, and if they are audio or video simply drag them into the left hand sessions area. If they are images, dragging them into the sessions area will cause VideoFOCUS to prompt you for a frame rate, and then a video session will be created with that frame rate and the images organized in alphabetical order; if you wish for the images to be treated separately by VideoFOCUS, drag them to the stills area instead. And finally, the Import Media dialog under the VideoFOCUS file menu can be used to try to import any media into VideoFOCUS and also offers the most control during the import process. The import dialog is also the way to import files that are a mixture of images and video and audio in one action. When there are multiple import options available for a selected file, the Options button will be enabled; Options can be used to force a transcode or change the aspect ratio or interlace type prior to import. Remember to change the “Files of type” filter to “All Files” if you cannot see the file you are trying to open. All of these capabilities are available in VideoFOCUS Pro, VFSource, and VFCapture version 6.0.5 or later. Starting with the release of Version 5.1 in 2015, in addition to supporting virtually all standard multimedia file formats, all three VideoFOCUS products (VideoFOCUS Pro, VFSource, and VFCapture) have also supported direct import of many proprietary DVR formats that previously could only be brought into VideoFOCUS through the real-time screen capture functionality. An integrated software component called DVRConverter, which additionally recognizes and interprets the metadata of many popular DVR formats and enables VideoFOCUS to correctly open these specific file types, achieving perhaps another 20% beyond what native parsing can achieve alone. DVRConverter was first developed for VideoFOCUS under a commercial licensing arrangement with DME Forensics, Inc., and is based upon technology contained in its DVR Examiner product. DVRConverter continues to be improved on a regular basis by DME Forensics, with additional supported formats becoming available to all VideoFOCUS users having current software maintenance as new builds are released. A complete list of the DVR file formats that are currently supported in VideoFOCUS by DVRConverter can be found here. For any questions related to importing and exporting specific file formats in VideoFOCUS, please contact technical support by e-mail at support@salientsciences.com, or by phone at +1 (919) 572-6767, option 2.